Hello, bike. It’s been a while since I’ve visited. No, it’s not really you. I still like you, but I’ve been busy. Yes, I know that we make time for what we value. Ever since I returned from the river trip to Bordeaux, my energy for our daily meetings evaporated. I had a lot of days in schools scheduled and I needed time to prepare. Today I woke up and knew we needed to become friends again. I have completed my days in schools. I have time for you every day. My timer is set for thirty minutes of nonstop peddling. Thankfully I have a distraction in front of me as the rhythm of pedals and hum of wheels spin around and around. Time on the couch reading flies by. Time working in my office passes quickly. Time on the bike s-l–o–w-s d-o-w-n, did it stop? Don’t look at the timer, just pedal. Pedal faster and faster. Concentrate on the story being told on the TV. Surely, the time is almost over! Sneak a quick peek. Half way! Another quick peek. Yes! I can do this! Make these last two minutes count! The barking dog brings the pedals to a stop. I am breathing harder. I am sweaty. I am finished! The cycle begins again, tomorrow. Yes, bike I will be back. It was a sunshine filled Saturday afternoon, it seemed like a perfect chance to check out the e-bike demonstration from our favorite bike shop. We drove out into the countryside to a mountain bike park. I didn’t have any intention of riding. I like flat paved surface to ride on. None of that was evident at this park. However, I couldn’t resist the urge to see what an electric bike would be like. I got my bearings on the bike by riding around the gravel parking lot. Oh, this is fun when the electric motor kicks in! I’m ready to try the trail. I thought I was ready to try the trail. Immediately, I am to climb a steep hill. No problem, I will let the motor take over and I will help by pedaling a little. Wait! The ground is rutted and rocky. Rather quickly I come to a dead stop midway to the top. There is no way I can pedal uphill. The motor did not keep me going. I began to walk up the hill with the bike. That’s when the heat and humidity hit me. I blinked to send the black spots before my eyes away. My head felt like it was caught in a spinning whirlpool. I couldn’t press on. I laid the bike down and collapsed next to it, trying to catch my breath. Slowly I sat up to let my vision clear. Once my breathing returned to normal, I began the climb to the top of the hill where I could wait in the shade for my husband. I had sent him on down the path, promising I wouldn’t move. When he returned, I s-l-o-w-l-y made my way down the hillside avoiding the ruts and rocks as best I could. This experience only confirmed my belief: mountain biking is NOT for me! I loved the e-bike, but they are a bit pricey right now. Hopefully, they will come down in price as I get older and have more need for an electric assist. This was taken moments before my issue. The scenery is beautiful. Can you see the rocks? This makes it look like the road was smooth, it wasn’t. There are gullies in the road. Can you really run into the grocery store and be out in less than thirty minutes? Rarely does that happen to me. What about reading? Just let me read thirty minutes. What? My time is up, are you sure it wasn’t just ten minutes? The recipe says thirty minute prep time. As I’ve stated before, that never works for me. Sorry dinner will be a little later tonight. Thirty minutes evaporates whenever you are totally engaged, but I have found one activity where thirty minutes feels endless, time crawls. Knees go up, knees go down, around and around, faster, slower, never stopping. Every day I face thirty minutes with resignation as I climb on my bike connected to a trainer in the garage to begin nonstop pedaling. A TV on the workbench tries to distract me from the inching of time. Pedal, pedal. I pick up my phone looking for distraction. Pedal, pedal. I can read email, three minutes pass. Pedal, pedal. What else can I do with my phone? Pedal, pedal. I’m limited because I seem to move too much. My finger hits the wrong thing if I try to play Solitaire or Word Warp. Pedal, pedal, pedal. Finally, the timer sounds! The pedaling slows. I’m sweating, breathing heavily as I gingerly climb off the bike. Thirty minutes completed! Until tomorrow . . . when the pedaling begins again. Without fanfare, the cool air crept in during the night, pushing humidity out the back door. Daylight brought crisp air and bicycles to the riding trail. I find my mind goes to a zen place as I settle into the rhythm of the pedals going round and round. On this day, the phrase “living a dream” echoed through my mind as I ticked the boxes of my life that makes this true. I was pedaling on a trail, while many were back in school. I can take vacations in off seasons. I have a very comfortable home that I love. The list could continue, but you get the drift. A voice took me out of my reverie, “On your left!” as a man sped by me. I noticed he was wearing a onesie type of riding clothes. “Hmmm, that’s different,” I thought. Then I checked my mirror to see if my husband was coming up behind me. After noting these bits of information, I then focused back on the trail where I was jolted out of my musings. A shriek escaped my lips as my eyes took in the sight. A huge black snake stretched across the trail, soaking in the sunshine. My heart leaped into my throat as I narrowly missed running over this snake. 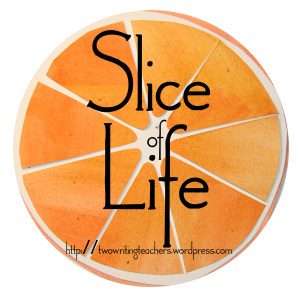 I wondered if my shriek was heard by the man who just passed me or my husband behind me. Slowly my heartbeat and breathing returned to normal. Then the regrets set in. I should have turned around to snap a picture of this snake, but I didn’t. I pedaled on. My shriek had not been heard by my husband, but he was shocked that I had not stopped for a picture. I wish I had stopped, but for some reason my feet just kept on pedaling. The snake was gone by the time I returned to the spot on the trail. Maybe next time I will be more observant before I nearly run over the poor critter. Fall has it’s own special delights that it brings to our world. Beautiful colors light up the landscape with the warm colors of reds, oranges, and yellows. Cooler temperatures allow us to add a layer, whether it’s to our bodies or our beds. We look forward to this change of season, but sometimes summer snaps its head and reminds us that it is not ready to depart. The blue sky with billowy clouds called us to enjoy a bike ride down the paved path of the Frisco Highline Trail. The colors were just beginning to creep into the foliage. Sunlight caught the silver sparkle of web lines overhead. Humidity pushed its way into the ride and wrapped its arms around me, but I didn’t let that slow me down. Pedaling created a breeze to savor. The world went into s-l-o-w motion when I saw it flying toward me. A teeny tiny, neon green worm (?) was riding the breeze and headed straight for my face. I turned my head and bike trying to miss it. Whew! That was a close one! 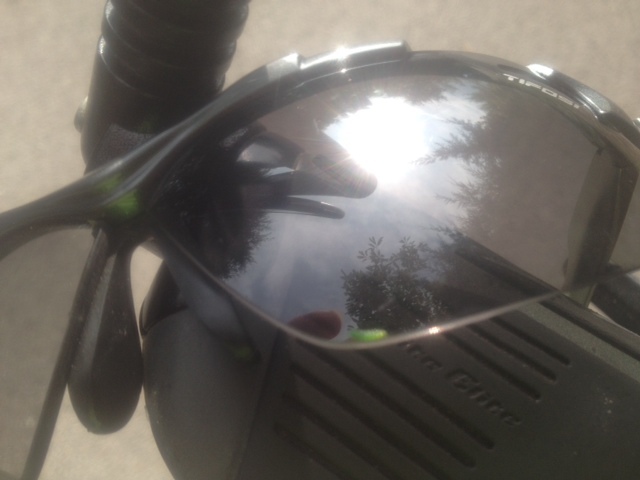 I pedaled on, but something was on my sun glasses. I thought it was a hair. As I pedaled, I pulled off the glasses and found myself gazing at that neon green worm frozen to my glasses. I guess it wasn’t a close call after all. I stopped my bike, because of course I needed a picture of this little critter. Multiple shots were taken, but they all came out blurry as it scurried across and around the lens of my sunglasses. Finally I blew a puff of air and it vanished. Look down along the bottom edge of the lens to see my hitchhiker. I looked down at my neon green shirt. There were several more little worms hanging on for dear life. A quick shake of the fabric sent them away. Fortunately I wasn’t that far from the end of the ride, I could just imagine/feel the worms crawling around on my damp skin and through my hair. I needed a shower to rid this creeping feeling! I was not the only one with green hitchhikers. My husband had several spots of green stuck to his face and shirt too. I just hate these hazards that Mother Nature sends my way. 1) It was time, my bike had been looking forlorn. My foot healed, it was time to return to the bike. The first time out caused a bit of fear. Fear was conquered. I can celebrate the return to biking. Now if only the weather will cooperate, I will be back pedaling the mornings away. 2) Each day I inspect the tomato plants. At first it was looking for the beginnings of a ball developing from the blossom. Then it was watching the ball grow bigger and bigger. Now I search for the color to change. 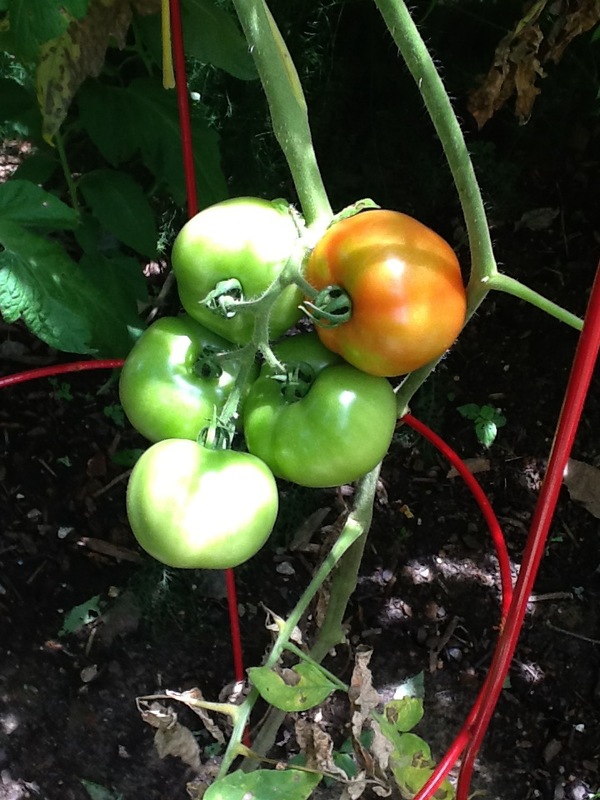 One lone tomato has decided it is time to cast aside that green coat and try on a more vibrant color. Hopefully the rest of the tomatoes will catch on to this new fad and they will want to be just as brilliant. Still needs to work on that color, but at least it’s a step in the right direction.